Can you recall walking into a weightroom for the first time? 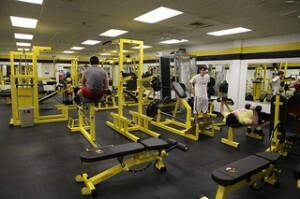 I still can, it was my high school weightroom and I was maybe 14 years old. Men, four years older than me were lifting much more than I could imagine, grunting, cursing, and straining their way to be better at their sport. I was told what the workout was and went to it. I remember that first workout. Three sets of 10 on the bench press, back squat, and incline bench press, and five sets of five on the power clean. I remember that my squats were three inches too high (no one back squats well the first day), my power cleans looked like reverse curls, and my bench press was 15 pounds too heavy for my strength levels. This happens all the time, young athletes are thrown into programs about which they know nothing, for which they are completely unprepared, and from which they are likely to get injured. The squat, the clean, and the bench press are the staples of programs for high school athletes in their school. There are three exercises that they can be taught beforehand that can set them up for ultimate success. We’ve all seen the picture of the baby in the perfect squat position. You know which one that I am talking about. The neutral spine and neck, the hips below the knees, the feet flat on the ground. So we all know that humans can squat…at some point. So at what point did people lose the ability to squat well? I can’t tell you for sure but typically it is before they hit the weightroom for the first time. The first key that makes the goblet squat the best tool for re-teaching athletes is the un-weighted goblet squat or prayer squat. Have the athlete take a prayer type position with hands together and elbows down squat to the bottom. At their lowest point let their elbows push their knees out . This is the first lesson that the Goblet squat can teach us. We must create space to squat to. We do not need to bend over to squat, because you will run out of room. Squatting must happen between the legs with a vertical torso. Move on to using the dumbbell or kettlebell and try the same thing. Squeeze the top of the dumbbell or kettlebell this time and see that your lats are turned on and because of this your entire torso is straighter. This is the second lesson of goblet squatting that other squats do not teach: The torso is just as actively a part of the squat as the lower body. We all know that I love the Olympic lifts but before I even get to teach athletes to Olympic lift the swing is very often my first chance to teach explosive movement. The benefit of the swing is that it is also one of the first times that I get to teach the athlete to hip hinge. Before getting to the swing begin by teaching the hip hinge pattern. The easiest way to do so is to grasp the kettlebell in a handcuffed position behind your back. This handcuffed position will start to teach the shoulders back, superhero chest position that will be important in the swing and in the Olympic lifts. The bell will be slightly below the glutes at this point. The athlete should unlock their knees and drive their glutes into the bell . There will be a tactile sense when this happens correctly. If the athlete gets into a back bend pattern the bell will remain below their glutes and make contact with their hamstrings throughout the movment. Actually moving the hips backwards in space will bring the bell up higher and in contact with the glutes through the movement. Do this movement slowly at first and then teach them to forcefully drive their hips to stand up. You have begun to teach the athlete to swing, and given them a hip hinge pattern to base much of their movement on. Next teach the swing and the snap that comes along with it. The swing is an excellent first explosive exercise to teach because it does not reward poor positioning. A relaxed core will lead to the athlete being pulled forward on their toes. The swing teaches athletes to make “something” move with their hip hinge and hip extension rather than with their arms, which will come in handy in the Olympic lifts later on. The big 3 at the high school level are squat, power clean and bench press so why aren’t we using this space for a push up? Quite simply many young athletes are not ready for the push up. For this reason we choose to teach directed stability in the plank to prepare the athlete for the push up. Most athletes that we encounter for the first time lack total body stability. Trying to place them in positions that require strength before they have stability will only build on top of deficiency. The goal of the plank should be to find stability throughout the body. Have the athletes lock the lats low, and forcefully contract the glutes and the quads. The core will be locked in without many cues at that point. With these three movements athletes will develop important patterns that can assist them in learning to do more advanced or more heavily emphasized lifts in the high school weightroom. Equipping athletes with these patterns can lead to fewer injuries and more success for the young athletes we coach down the road. You are so right about all 3 Wil. One thing we like to do to at AR Indy is teach the hip hinge with a band around the pelvis. This aids in pulling the hips back and helps the athlete to feel the motion of hips back and then ultimately forward. This also turns the glutes on more when they have to press the hips through the band to stand erect. This coupled with a KB swing once the athlete is skilled in this movement really works wonders. The other thing that you could not be more right about is the plank. We fought this for a while but quickly found exactly what you said ” your only building on top of deficiency”. What good is that? Stability before strength is the only way to go. Wil you are right on, which is why I consider you one of my top 3 go to guys in the nation when it comes to furthering my education! Keep it up and congrats on your competition. It’s so important that young athletes be taught proper form for weight lifting AND know their limit. If you push too hard too fast you run the risk of hurting yourself. I know guys want to show they are as strong as the rest of the team, but you don’t want to seriously injure yourself and sideline your athletic career because of it!